Another reason why I have not been doing any painting. Can’t clean the paint crushes when you have no water. Our water tank. It is filled from water coming off the woolshed and yard roof. Greeting loyal readers and fellow maremmas. Now as you all know We live in the countryside. As the locals would say, We live in the “wop wops“. Far, far away from any city amenities, such as water. We rely upon a combination of tank and bore water for our water needs. A 30,000l tank supplies the house with water for everything expect the toilets and outside taps, which come from the bore. The bore also supplies the household needs of two of our neighbours, as well as a number of stock troughs. Over the last week it was apparent that there was a problem with bore water supply. So it was D.I.Y Daddy to the rescue. First Spring Lambs arrive in middle of winter. Read more at Jasper’s Doggy World. It is the middle of winter but it has been a mild one. Cold mornings but warm days, but also lots of wind and rain. Greeting loyal readers and fellow maremmas. Now as you all know We three live in the sunny Mangamahu Valley and it is winter time in New Zealand. Soon signs of spring will appear – daffodils and magnolia flowers. One early sign of spring’s arrival in the appearance of spring lambs in paddocks. Now as you all know We have six sheep and mummy was expecting to see lambs in a few months time. Well, yesterday morning she was out getting some wood and happen to glance over to one of the front paddocks. There she saw something little and with a wagging tail. Yes, you guested it, new lambs. Boy she was surprised!! Mummy thinks we might get some more lambies soon. Watch this space. Love Nellie, Jasper and Itai, the three bestest maremmas in all the land. Happenings on a Sunny Sunday Mangamahu Afternoon. Another small taste of our rural life. Hope you enjoy this post from Jasper’s Doggy World. See Me and Nellie in the afternoon sun, waiting for mummy to come home from town. Greeting loyal readers and fellow maremmas. The weather still continues to be warm. In the afternoon the temperature often reaches 22 C (71F). Not bad for halfway through autumn. Now as you all know We live on a lifestyle block in the sunny Mangamahu Valley. Mummy and daddy run a couple of cows and a few sheep. Today, neighbour Paul had to sort out some of his sheep and return our stud ram called Romeo. So, mummy and daddy said they’d help him. For some reason Me, Nellie and Itai were left at home. Something about being a nuisances and distractions. It was more like 21km and 12km of it was uphill. In a few of the pictures you can see the old Coach Road (abandoned nearly a century ago) that serviced the remote hill farms. They were abandoned when a new road was cut along the river valley in the mid-20s and the farmers built new homesteads along the new road. And we were sore the next few days. Mummy and daddy at the start of their tramp. Greeting loyal readers and fellow maremmas. Early on Saturday morning, mummy and daddy abandoned left Us three and went off in Mummy’s little white car. 87 hours later they came home, very tired, with muddy feet and moaning about sore muscles. As if We all cared. It would appear that they had been on a 15 km (nearly 9 miles) tramp up (in as one would say in New Zealand) the wop wops. 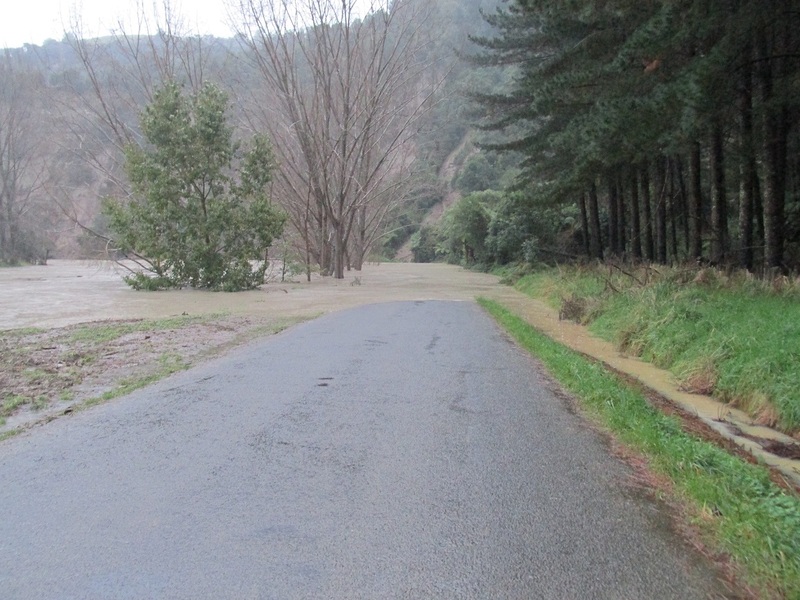 Which in this case was 30k (18 miles) up the road to almost the end of the Mangamahu Valley. Lunch time was at an abandoned old farm-house, referred to by the locals as Siberia because of its remoteness. 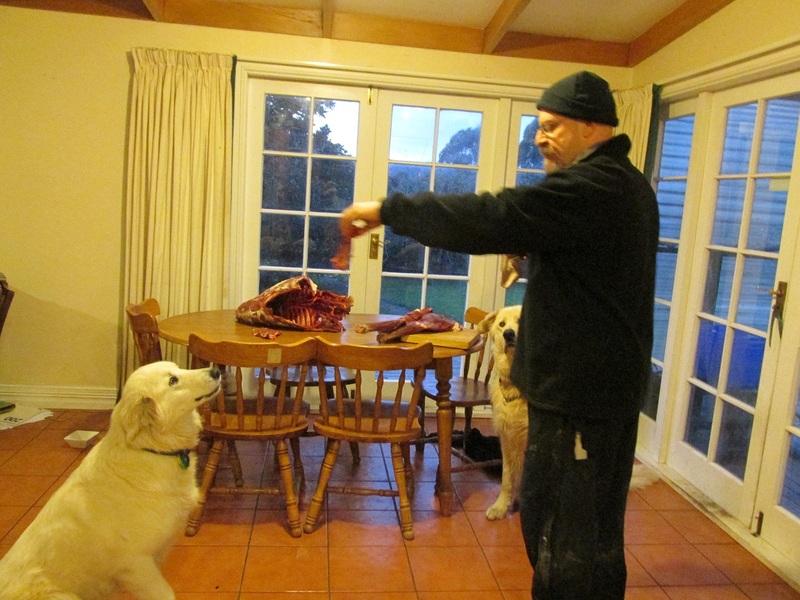 I thought some of my overseas readers would like to see a bit of New Zealand – we went on a road trip to get another dog. Check the full post at Jasper’s Blog. And here are some photos of the New Me!! Mummy and Daddy say he is so laid back that he is almost horizontal. And now for our international readers, who may think that all there is in New Zealand are hobbits and sheep, you will be glad to know that We too have access to 24 hour a day hamburgers in such cosmopolitan town of Taihape, the gumboot capital of New Zealand. And one last photo for the road. Just some background history to our property and some of the neighbouring properties in our valley. 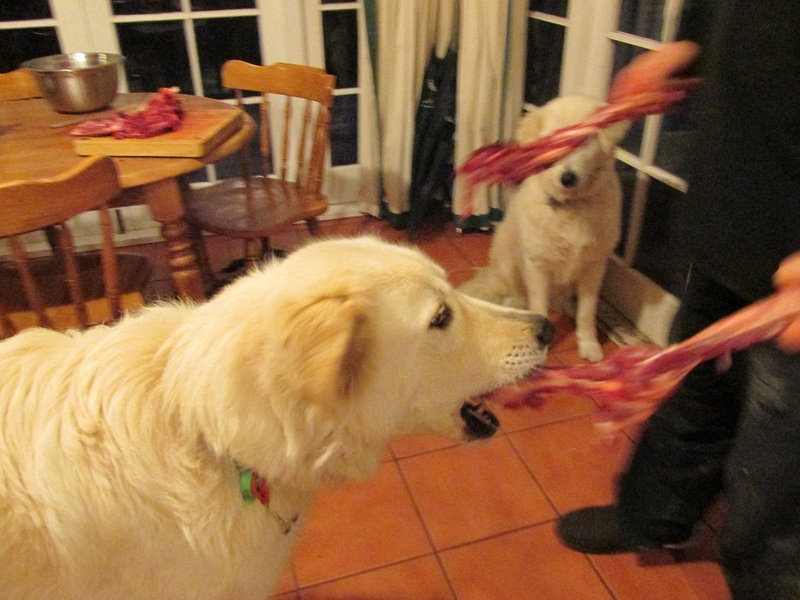 From our very clever Maremma dog Jasper’s personal blog. Greeting loyal readers and fellow maremmas. Last weekend, mummy went on a house and garden tour to one of the oldest houses in the area. 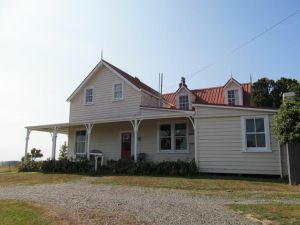 The site has been lived on since the early 1840’s, which in terms of New Zealand history is an eternity. 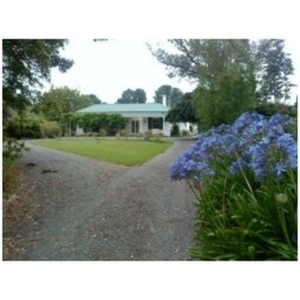 It was first owned by Dr Allison, The following is from: The Cyclopedia of New Zealand [Wellington Provincial District] Farmers, Old Settlers etc. Plans? We don’t need no stinking plans. The Woolshed is in need of some serious maintenance over the next year or so. I have to replace an outside wall that is slowly coming apart from age. It was constructed out of rough cut timber that was probably milled on site at least a hundred years ago. There are old shearer’s autographs on the walls that go back to the 1920s – reminders that at one stage this was a working woolshed. But…the outside wall was not the object of my attention this week. Son and I lined a wall with scrap pallet wood to continue the rustic look of the interior. It looks quite good, if not a little rough – which is kind of the look I was going for. Mind you, if I had been going for smooth clean lines it still would have come out rough because I am not one of life’s great carpenters. Other improvements on the long term plans are a septic tank so I can install an inside dunny (there is a longdrop outside), a kitchen and perhaps a shower. This Woolshed is a work in progress but will be New Zealand’s best Man Cave before I retire! Today I decided that I needed a workbench. It was raining so mowing the lawns did not appeal at all. I didn’t want to spend any money on this workbench, so used scrap wood that was in the wood pile in the old stock yards (the same source as the pallet wood). I didn’t have any decent timber for the bench top so what I have done is temporary until I can source some more 2″(50mm) thick timber at a good rate – which for me means free. Oh yeah – I didn’t have any actual plans – it probably shows. I need a workbench for a number of projects that I want to get underway this year. I rationalised it to Mrs Woolshedwargmer as a place that I can repair the mower. However, I really want to have a decent work bench to start making some terrain tiles – something I have wanted to do for years and finally decided that 2016 is going to be the Year of the Wargame Table. I also want a space where I can restore an old motorcycle that we may come into possession of in the not too distant future – an old James Captain from the 1950s. The only problem is that now that I demonstrated my ability to make a workbench that didn’t wobble, SWMBO has ordered some garden furniture – that she want me to make tomorrow. What about “Terrain Tiles” doesn’t she understand? The vertical studs were not true, which meant every few layes of boards had to be remeasured. The Hounds wanting some of my morning tea. SWMBO made muffins. We love muffins. I think I measured the timber wrong. It can support a coffee cup – a good omen. I couldn’t find my square so made one. 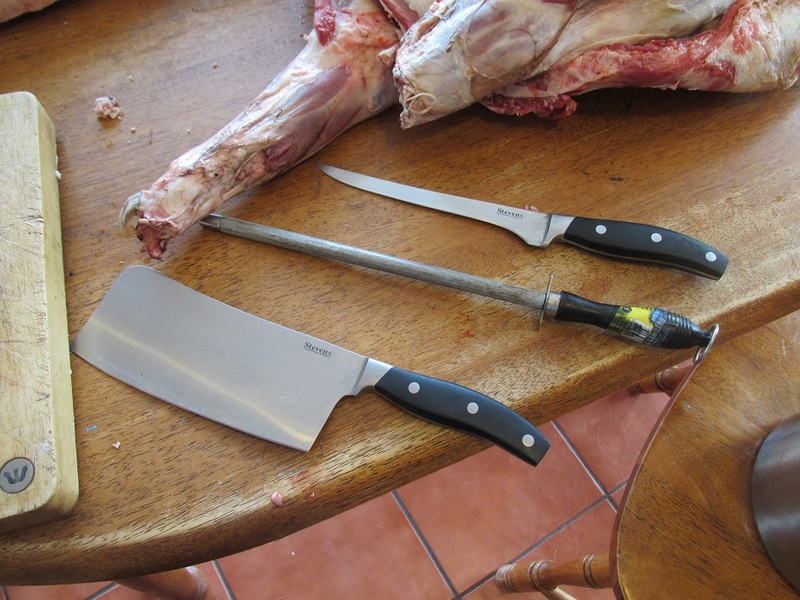 Part of being on a small holding is dealing with animals and sometimes dealing with animals is not a pleasant task. Our ‘flock’ is tiny. We have three ewes, a ram and two ewe lambs who were just a tad too young for breeding this year. Last year we had a ewe that had a bad prolapsed uterus. Got her through that and she had triplets. This year it happened again but I did not get to her early enough – it was out too long and she was really a goner. Had to kill her and do an emergency caesarian to get the lambs out. 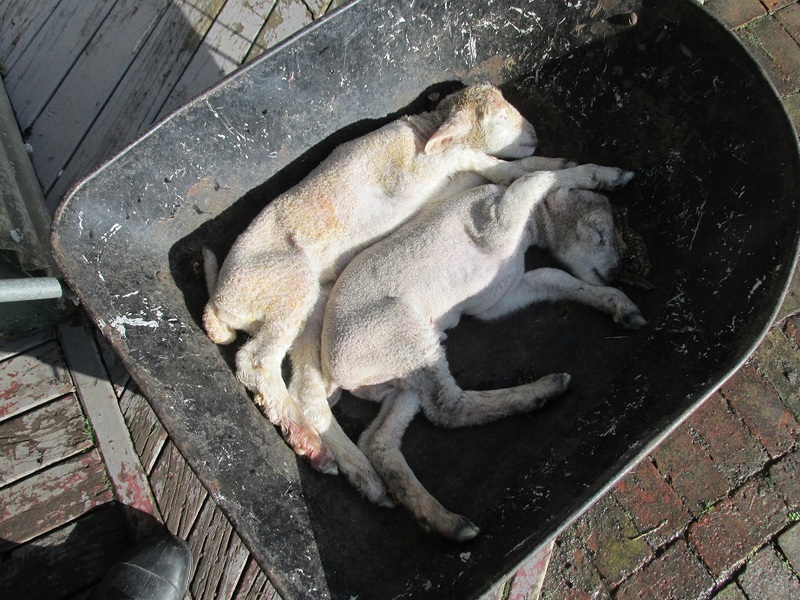 Managed to keep them alive for a while but they were probably too stressed from what Mum had been going through. Probably for the best that she was culled because uterine prolapse is passed on and any ewe lambs she had that may have survived would more than likely have similar problems. And if nothing had been done she would have died in the paddock. 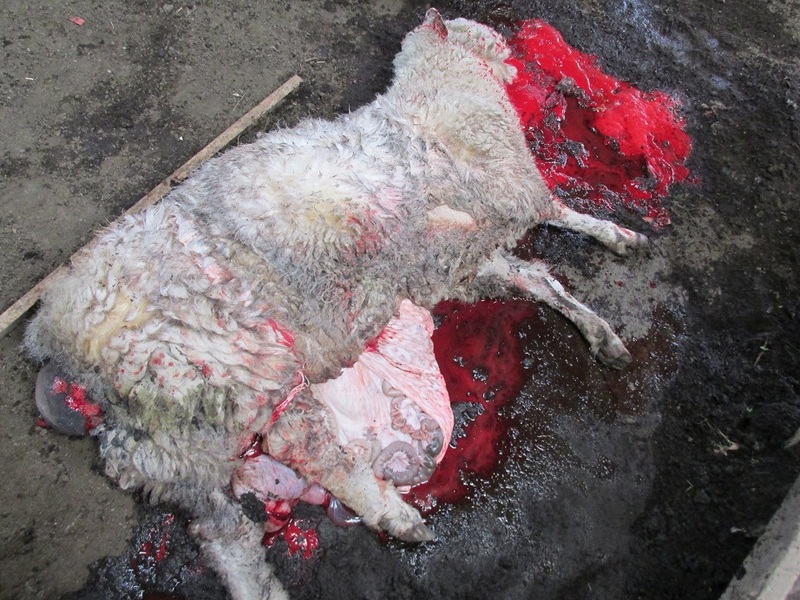 Some people may find this pretty disgusting – I did and I was there but it is part of dealing with livestock. Supermarkets are so much easier because you can buy your meat without a thought for the poor critter it came from. Still, waste not, want not. 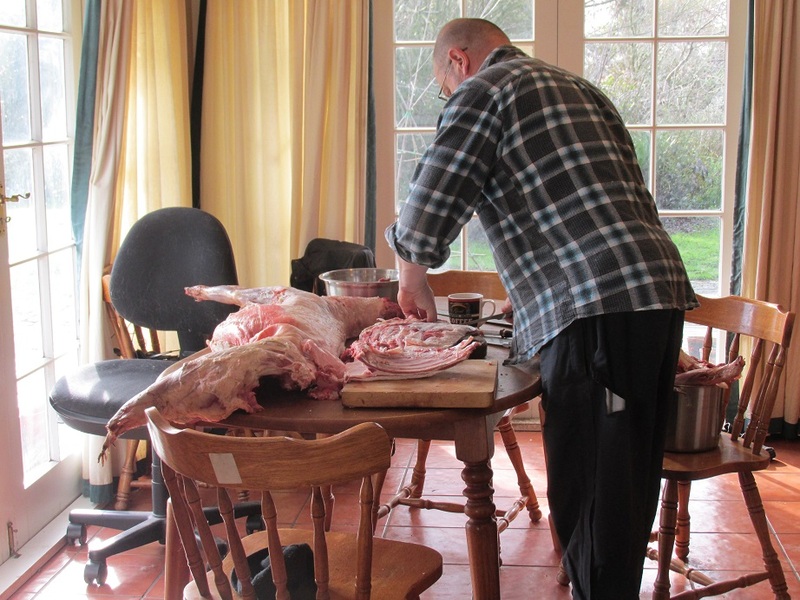 It is a good thing that we like mutton. 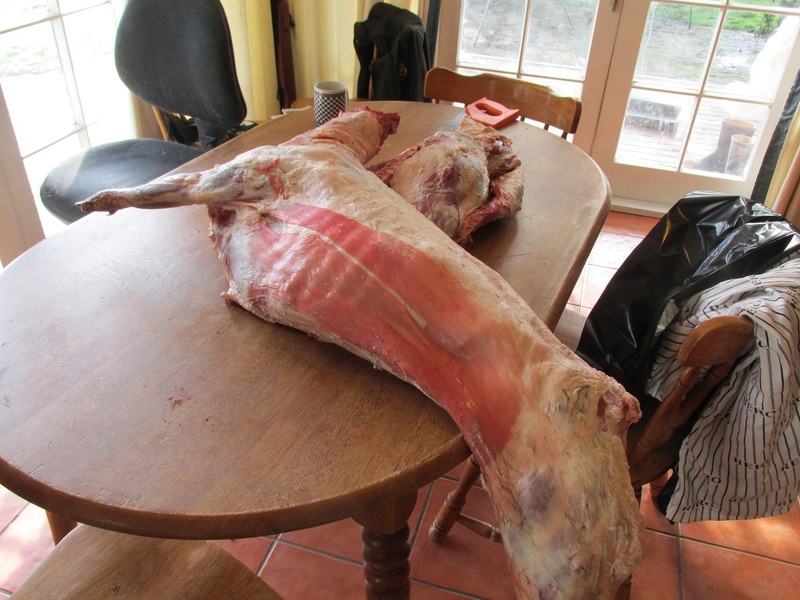 She was skinned and dressed and hung in the cold killing shed (it got quite cold here last night so the meat had set quite nicely by this morning). She was carrying a lot of lambing fat but still got quite a goodly amount of meat off her. 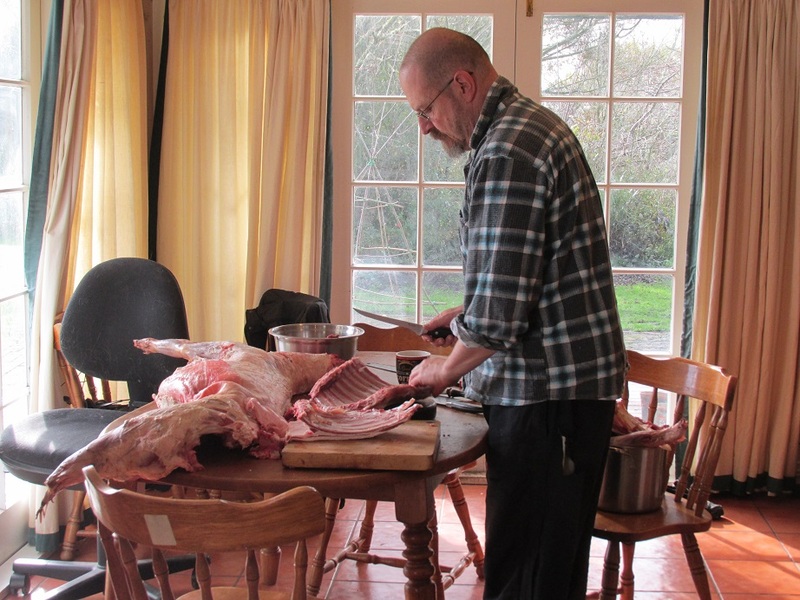 I minced most of it – except for the shanks (for slow cooking) and the leg roasts that I usually cut up for curries and stews. Kept a lot for dog tucker as well. All freezered. Sheep prices have nose-dived in this region since we had the big floods in June. 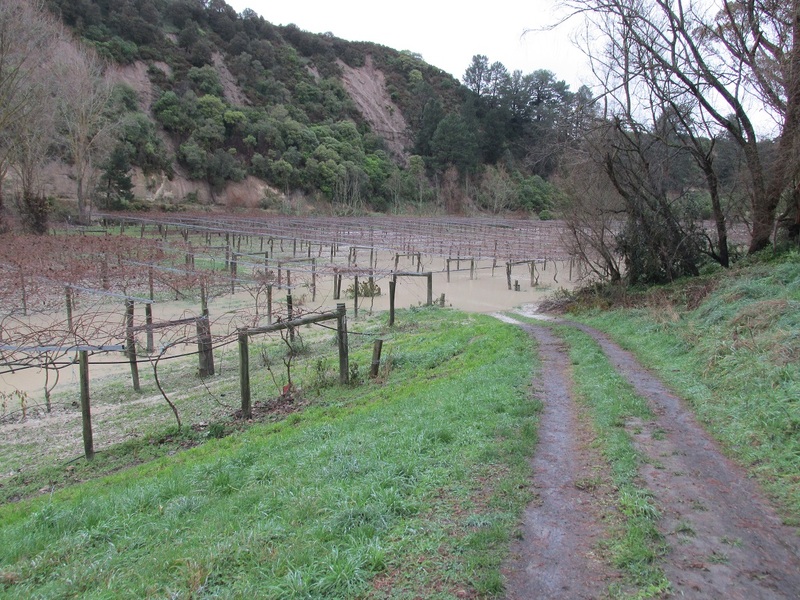 A lot of farmers lost a lot of grazing land to slips and have had to de-stock. The meat works have a backlog of 700,000 sheep at the moment and are not buying – so prices are down. Two years ago a pregnant ewe was going for $200.00 or more. Lucky if they fetch $50 now. So we will pick up a few more, plus the ewe lambs we kept from last year so should have a good supply of lamb for 2016/17. Well the rain came, went and left a huge mess. 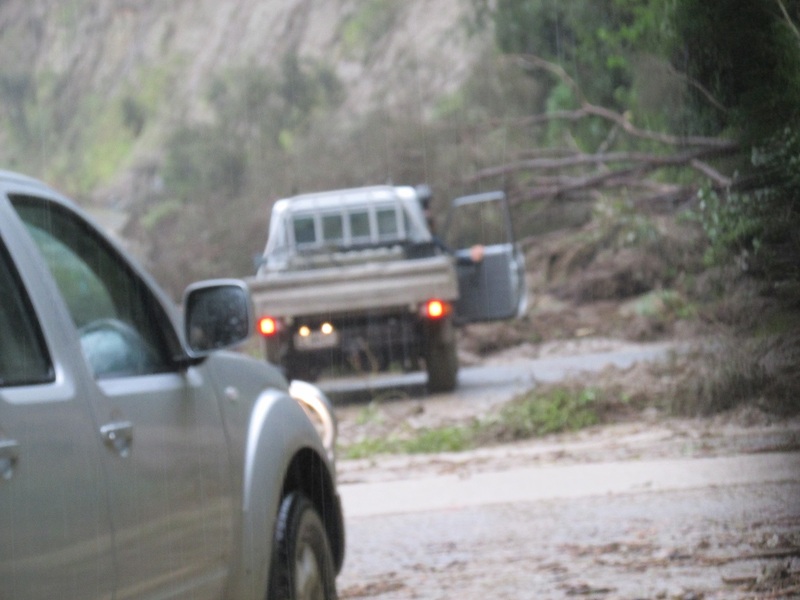 Big slips have caused a lot of damage to local rural roads. Ours is blocked for anywhere from another few days to ten days, depending on the source of the latest rumour. We were without power for only a day – the linesmen got whatever broken line caused our outage fixed last night. So good to have electric lights back. Reading by candlelight might be quaintly nineteenth century but it is hard on the eyes. Painting was definitely out. The Woolshed however was dry and all my models came through unscathed. 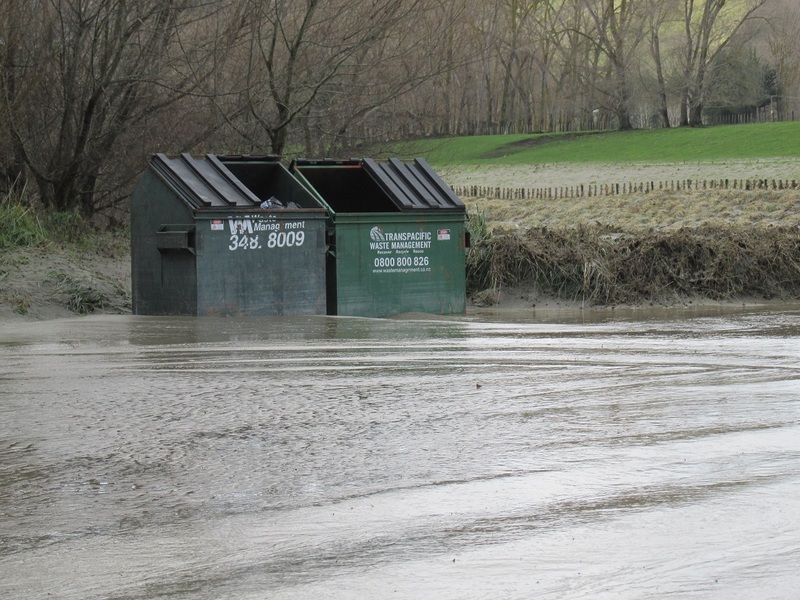 Ten years ago when we lived in Wellington we got flooded and I lost a stack of models – and all my Battlefront 15mm Sherman/Stuart tank turrets floated off – the models themselves stayed put because they were on magnetised bases in a steel tool box – that was open at the time. This time everything high and dry. Some pictures from the last two days. The first of many slips blocking our road access. The Kiwifruit orchard next door where my son works when he is on University breaks. Our local rubbish collection point. You can see the high tide mark of the river on the bank opposite. The road on the other side of the river from us. Looks completely gone in places. The slips sounded like trucks engine breaking as they crashed down. 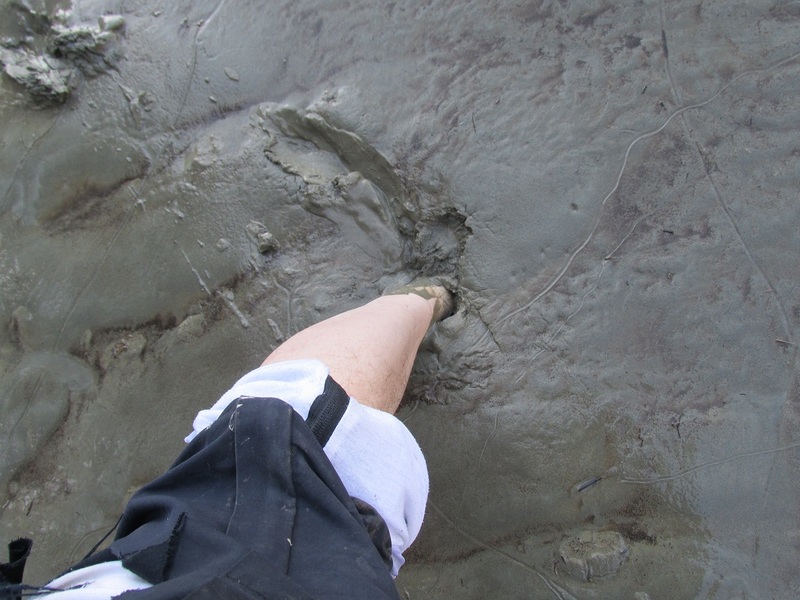 Silty volcanic mud. 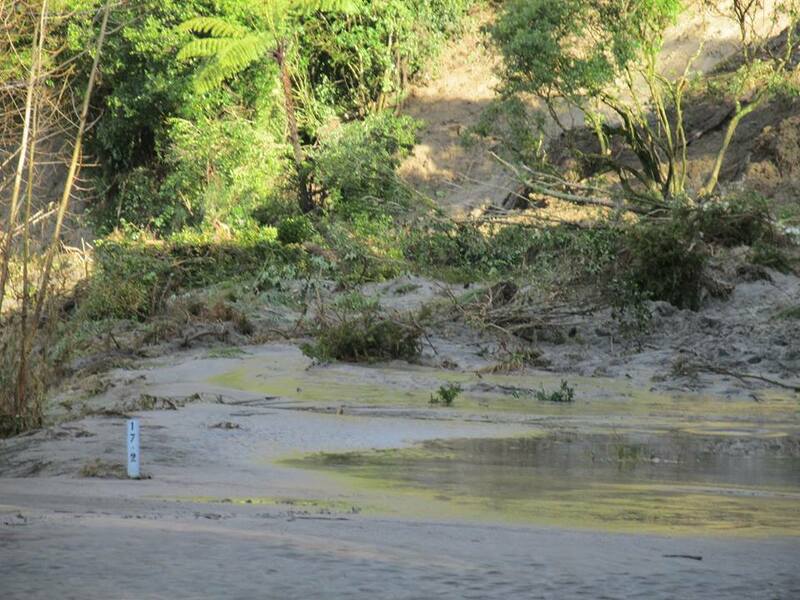 It is sticky and glutinous – this is down the road from our place about a kilometer. 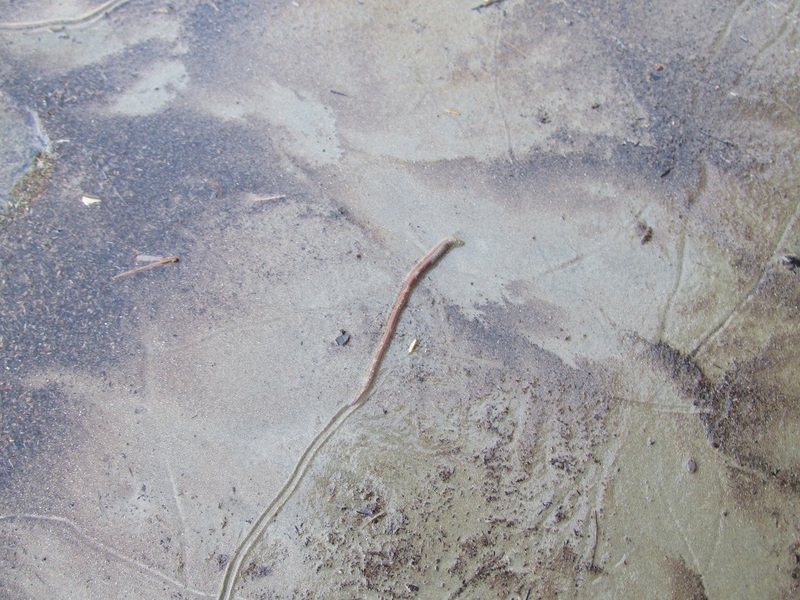 The silt is so fine it suffocates everything – the entire surface was criss-crossed with worms tryimg to find a way to safety. My daughter got choppered out and went back to school. 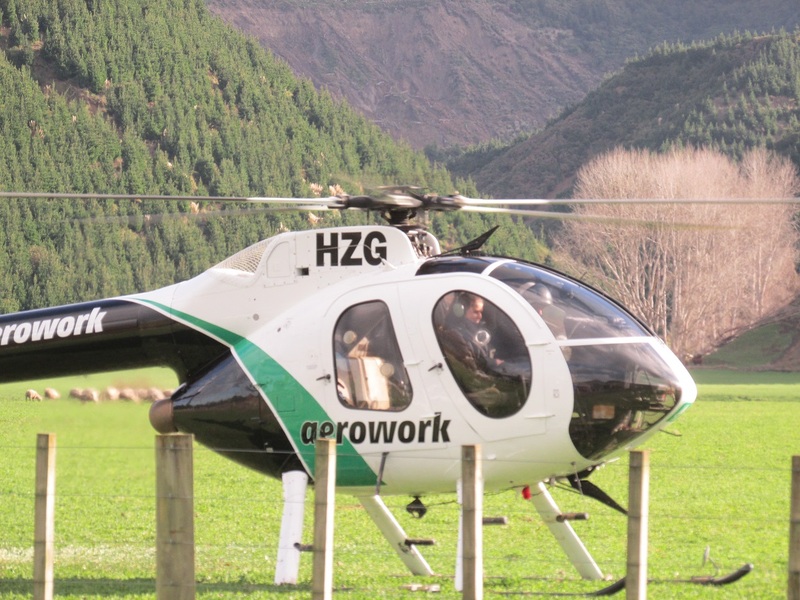 Aeroworks – great guys. They are doing supply runs into the valley and taking people out who need to get out. Daughter has school ball this Friday and it was this or a tramp through the forest to get out. She wasn’t missing it on account of the worst flood event in the district in a hundred years. Talk about roughing it. Fresh venison. Some for the helpers too. Guess what – it is raining. Raining a lot. The flood warning has the river that runs through our valley peaking tonight about midnight. 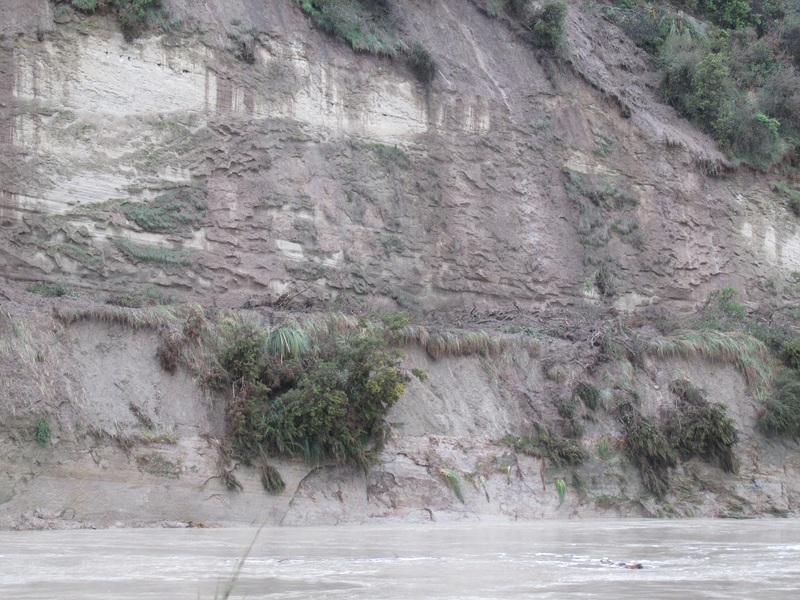 We are already cut off – first it was slips and then the river breached it’s banks. We have been moving neighbour’s stock to higher ground and keeping an eye on their place as they are away but now it is dark it is a matter of waiting to see what tomorrow will bring. Why we couldn’t get out of the valley this morning. 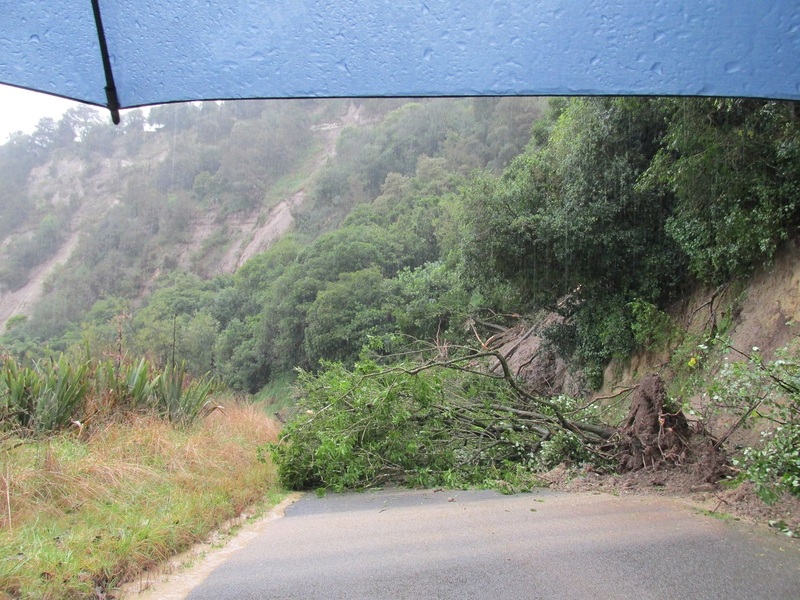 While we were there you could hear trees up the bluff breaking and more slips started coming down so it was a quick u-turn and out of there. Why we can’t get out now. 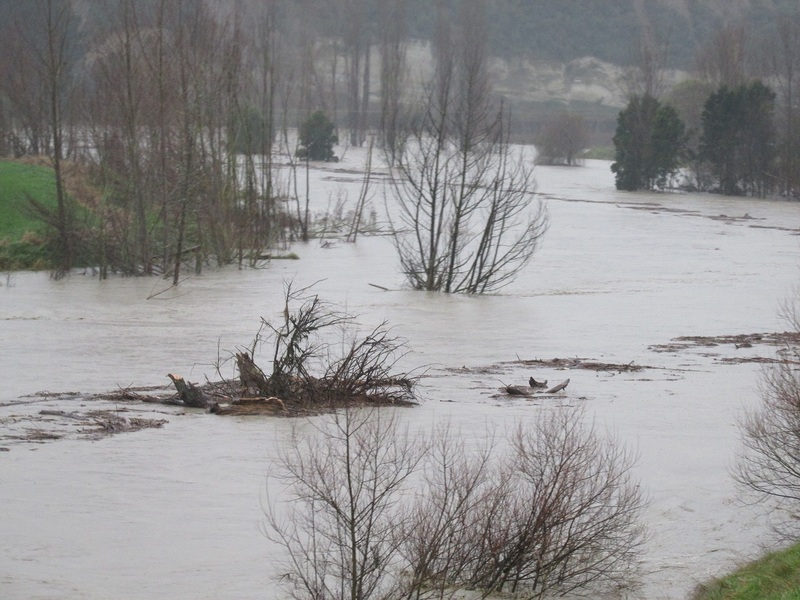 The same spot this afternoon – under at least two metres of water already. Some views around the Woolshed. I half expected to see Tom Sawyer and Huck Finn on some of these rafts. 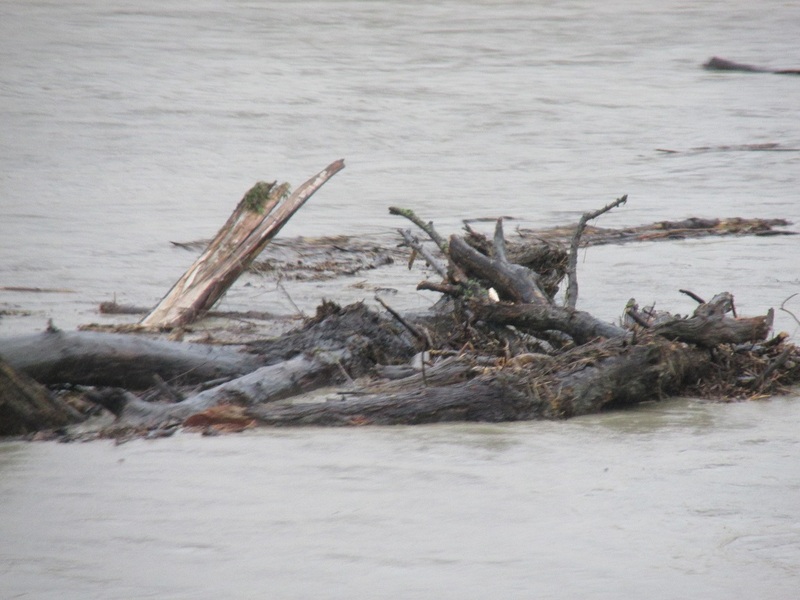 Just a continuous stream of trees going down river. 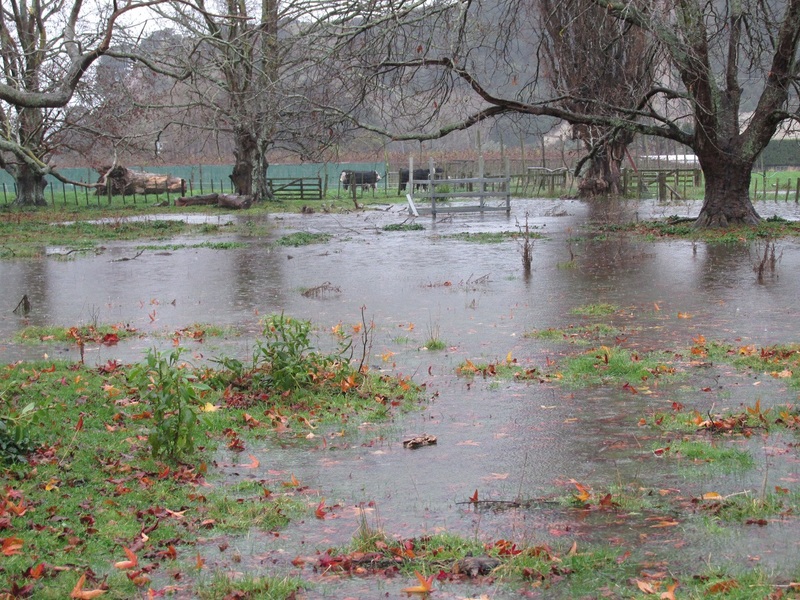 Surface water in our front paddock. 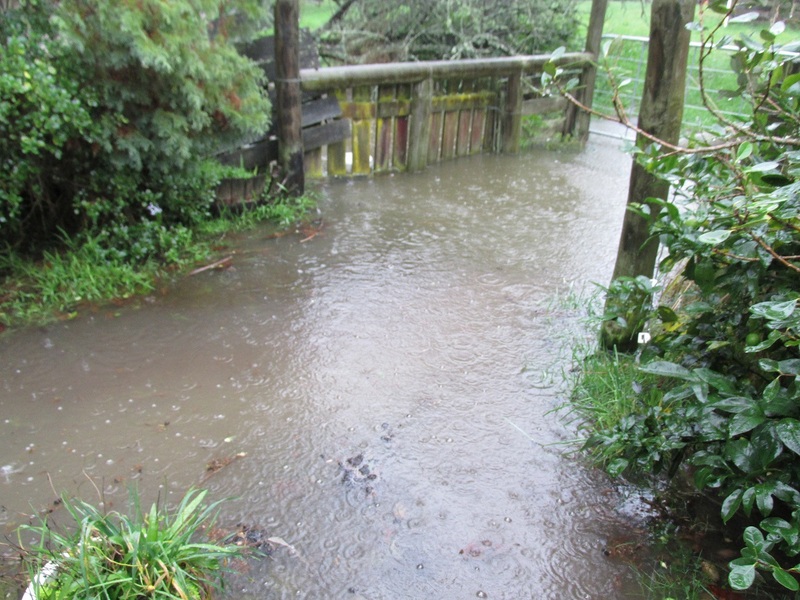 This is the foot bridge between the house and the Woolshed. About a foot and a half under water when this was taken. But at least we have power and the internet. The 21st Century has not abandoned us…..yet.